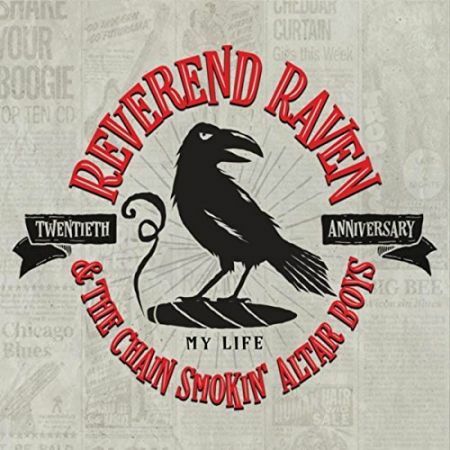 On any given weekend if had to pick one band in our area to go listen to I would track down where Reverend Raven and the Chain Smokin’ Altar Boys (CSABs) are playing and go out there and sit down with them to listen to them for some blues done the way they are supposed to be. 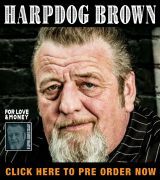 This CD celebrates 20 years in the life of the best blues band in the Mid West. Rooted deeply in the sound of old school Chicago blues and based out of Milwaukee, Wisconsin, Reverend (Richard) Raven has spent the last two decades honing a sound that is unique, sublime and enticing. The vocals and instrumental work is never over blown or over done. The solos are tasteful and authentic. The band knows what everyone is supposed to do and does it. No one steps on each other’s toes and everyone works to make the sound better. In 1993 Chief Raven got out the Navy and supplemented his separation pay with gigs in Milwaukee and Wisconsin’s Fox Valley area. He honed his sound as he replaced the 16 year old wunderkind Scott Sharrard with the Blues Disciples. He worked on his chops and tried to avoid getting his head cut off by special guests like Perry Weber, Billy Flynn and Mel Ford. The Chief then ventured out on his own a bit with Jimmy Rogers’ harp man Madison Slim. Slim was still touring with Rogers so the work with Slim was a side project for both the Rev and Slim. When Rogers passed away the CSABs were born 20 years ago in a South Side of Milwaukee tavern called Jim Dandy’s. Larry “The Legend” Taylor was on drums. They were playing in a country bar but when George Stancell walked in with a gold fur coat and sang with abandon and Slim killed them with his sad and blue harp solo and the band began it’s trek across the Cheese Curd Circuit of the upper Mid West. Lamont Cranston helped get them noticed and the crowds grew and grew. They worked their way up to playing Buddy Guy’s Legends and opening for B.B. King at the Surf Ballroom. They tour the Mid West and South East with annual tours to the Virgin Islands and now Jamaica. From a poor kid on the South Side of Chicago hanging out at the Checkerboard Lounge to today, the Rev never dreamed he would get this far. A half dozen CDs, many awards and packed houses wherever they go are the norm now. Life is good and the Rev is thankful for his hard won success. The bands have changed over the years. Cadillac Pete Rahn played harp with the Rev after they met on Bourbon Street with Bryan Lee at the Old Absinthe Bar. Madison Slim was from Jimmy Rogers and the Legendary Blues Band. Benny Rickun was a harp protégé of Mid west harmonica legend Jim Liban and he and the Rev spent time together when Slim moved south. Big Al Groth played sax with the CSABs after the Rev met him with Bobby Sellers in the Rhythm Dawgs in Kenosha, WI playing that old style honking sound. His current harp cohort is westside Andy Linderman who he met when Andy was with Paul Black and Flip Kings. They tour today joined at the hip with the swinging-est and coolest sound on the circuit. Each of the players added their talents to the band and are represented on this CD. Piano and organ players also came and went in the band. Ron Kovach, Danny “Pork Chop” Moore, and Mickey Larson have each spent time playing with the Rev and appear here. Jimmy Voegeli also makes a special appearance. On bass are Andre Maritato, Brad Bull and his long time bass man PT Pedersen. Vic Span, Spencer Panosh, Bobby Lee Sellers Jr., and now Spencer’s brother Craig Panosh have played drums for the CSABs. Jeff Roberts appears on rhythm guitar on a couple of tracks. Each has brought their enormous talents to the band and this CD. All the songs were written by Rev Raven who produced the album with help from Steve Hamilton. The first three tracks with Cadillac Pete are completely remixed and sound fresh. Track 4 with Madison Slim has never been on a CD before. The stuff with Benny is on tracks 5 through 10 and Andy is featured on tracks 13 through 16. Moore is featured on tracks 6, 7 and 9 through 16. While these songs all appeared on other CDs with Benny, Andy and Pork Chop appeared on other CDs, tracks 7, 9, 11, 12, 13, 14, 15 and 16 are brand new versions of the songs for us to enjoy. “Handyman’ opens the set. A long-time staple of the Rev’s shows, this is a sweet and bouncy little shuffle with some dirty killer harp from Pete. He gets the first solo and then the Rev lays out a tasteful and restrained solo of his own. “Bee Hive Baby” and “Creature of Habit” also feature Cadillac Pete. The former has a driving beat and the Rev’s vocals are sublime. The solos are Pete and then the Rev with some chicken scratching thrown in for good measure. The latter is a nice jump blues with Pete and Rev trading off solos again. “Bad Little Girls” is an older recording that was never released before. Madison Slim greases up his harp and the Rev delivers the lyrics in his ever-captivating baritone style. Slim takes the lead first and blows a mean solo and then the Rev rings clear with his own and takes us home. The “Rickun Era” songs are next. “I Want To Love You” starts us off with a winner with a driving beat. “Once Women Start Talking” is another CSAB standard his fans have all grown to love that is well done here, too. It’s got a rumba sort of beat and just a great vibe to it. “My Life” is another Rev Raven classis. It begins with a nod to his sailor days, “I’ve been around this world, I’ve sailed the seven seas,” as the Rev embarks on a tune where he searched for the woman of his dreams. Danny Moore blazes on the ivories and Benny is quite effective on the harp, but the Rev sells one with his slick vocals and guitar. “Here Comes My Baby” is another rumba-styled tune with Jimmy Voegeli coming in for some pretty organ work. The Rev stings with his big time guitar solo and overall work here. “Praying For A Princess” is a jumping cut that Benny launches with abandon. He, the Rev and Moore once again blaze as this song goes 100 mph with reckless abandon for a very fun ride. “Big Bee” is classic CSABs, a take off of Slim Harpo’s “King Bee.” Distorted vocals dirty this up nicely and the big harp sound from Rickun also makes this one special. “Looking For Love” and ”Slow Burn” are the two saxophone pieces with Big Al. The sax is awesome on both and Pork Chops piano interplay with him is also spectacular. The Rev jumps and jives with his guitar and vocal work as the boogie woogie of “looking For Love” unfolds. “Slow Burn” is a mid tempo piece strident guitar and the sax and organ adding a lot to the mix. The last four cuts are the Westside Andy tracks. “Someday When I’m Dead and Gone” is a blues shouter tune as Andy’s harp responds to the Rev’s vocal calls. Andy plays some wicked harp to complement the well-paced and strident guitar. They take things way down with the slow blues of “I Can Do You Right” where the guitar, harp and organ all take us to church. The rumba returns with “She’s Moving On,” with a testimonial that the Rev testifies to us about how his heart was torn out by that woman in red Ferragamo pumps. This is another staple of his fine live shows that his fans (and I) love. All good things must come to end and so does this great CD. “I’m Your Honeyboy” is a swinging jump blues with Danny Moore on piano and Jimmy Voegeli delivering backing vocals. Andy’s harp work is spectacular here once again. The Rev’s guitar takes a long solo to take us home as he, Andy and Pork Chop help him fade into the sunset. Wonderful stuff! What can I say? 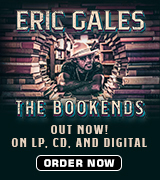 This is some great stuff to commemorate 20 years of some of the blues worlds best music from one of my all time favorite artists and his band. As I said earlier, this is blues the way blues were meant to be played. Run do not walk, and go buy this one NOW! You will not regret it!